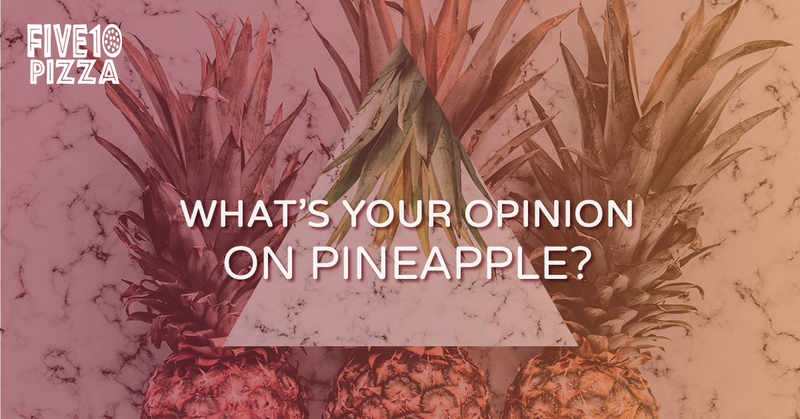 What’s Your Opinion on Pineapple? Hello there, and welcome back to our blog! Here at Five10 Pizza in Oakland, we spend a lot of time thinking about pizza. Whether we are coming up with new recipes or simply thinking about the wonderful combination of cheese, toppings, and dough that we make every single day, pizza is a part of our lives. Because we are so invested in the world of pizza, we feel that we should discuss a debate that has been going on for years in the pizza world. This debate has caused two factions to develop, factions that are entrenched in their way of thinking and, for the most part, cannot be convinced to change their stance. The debate surrounding whether or not pineapple should be placed on pizza is one that will probably not come to an end any time soon but, in today’s post, we wanted to try to list out some of the opinions on each side and hopefully help people who may be on the fence about this subject make a decision. Continue reading below to learn more. How Did Pineapple Even Get on Pizza? Although there is some debate surrounding the initial invention of the pineapple pizza, most experts agree that we can thank Greek-Canadian Sam Panopoulos for popularizing pineapple on pizza. In 1962 Panopoulos invented the first Hawaiian pizza at the Satellite Restaurant in Chatham, Ontario, claiming to have gotten the idea from preparing Chinese dishes which often mixed savory and sweet flavors together. Initially, the combination of pineapple, ham, and bacon was not very popular, however, over time the combination became a local favorite and quickly became available in pizzerias around the world. Since its introduction, pineapple on pizza has continued to be a divisive subject, with pizza purists claiming that fruit has no place on a pizza and pineapple lovers claiming that pineapple and ham, combined with the savory tomato sauce found on pizzas, is a combination that should be celebrated. One of the hardest things for people to understand about putting pineapple on a pizza is how it even tastes alright in the first place. For the most part, any other fruit that a person decides to place on a pizza is going to taste wrong. Luckily, there is some science behind the combination of pizza and pineapple that helps to explain people’s preference. People, naturally, are omnivores, meaning that we desire a variety of foods and tastes. If a person eats only salty or sweet foods, eventually, they will tire of these flavors. However, with flavor layering (such as placing pineapple on pizza), flavors blend together in our mouths without actually giving a specific taste. By avoiding specific tastes, the salty/sweet combination of pineapple on pizza satisfies all of our natural cravings without being overwhelming. Join us again next time as we continue to cover the debate over placing pineapple on pizza. If you already know that pineapple is an excellent addition to pizza or you would like to try pineapple on pizza for the first time, please visit us today at Five10 Pizza and try our OG Kush pizza. With ham, pineapple, garlic, and jalapeno, this pizza is sure to leave your taste buds wanting more.